TEGUCIGALPA, Honduras – U.S. Navy medical professionals assigned to Southern Partnership Station’s (SPS) Fleet Health Engagement Team (FHET) arrived in Honduras Sept. 14 to begin subject matter expert exchanges (SMEE) and partner capacity building engagements with Honduran medical and emergency management professionals in Tegucigalpa as part of SPS 2018. 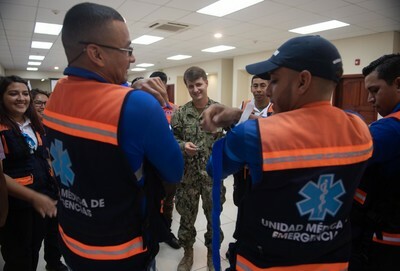 SPS’ FHET will conduct SMEEs with Honduran representatives focused on specific topics such as tactical combat casualty care (TCCC), preventative medicine, humanitarian assistance and disaster relief (HADR) response procedures, and insect-borne disease prevention. Following productive visits to Colombia, and Trinidad and Tobago, this stop marks the third FHET engagement during SPS. The FHET is scheduled to conduct their final mission stop of SPS in El Salvador to work alongside the nation’s military forces, security forces, and civilian health professionals. Engagements like these hone participants’ skills in a variety of knowledge and skills, including HADR. Southern Partnership Station’s FHET medical exchanges will continue to lay the groundwork for future endeavors. Held on an annual basis by U.S. Southern Command and executed by U.S. Naval Forces Southern Command/U.S. 4th Fleet, Southern Partnership Station is a U.S. Navy deployment focused on SMEEs with partner nation militaries and security forces in the Caribbean, Central and South America. SPS is a demonstration of the strong U.S. commitment to partners in the Caribbean, Central and South America, fostering goodwill and enhancing our collective ability to respond to natural disasters and humanitarian crises. SPS will conclude in October 2018.